There’s a few things that I feel I’ve been able to master in the 35 years I’ve spent on this planet. Pretending I’m dead asleep while the baby cries in the middle of the night so that my husband would get her (hey! he does the same thing… we all do, don’t hate), dropping’ it like it’s hot, eating cookies and THIS. A whole roasted chicken. And hot damn it is one fine whole roasted bird. I’ve even learned the trick to making the skin perfectly crispy. We truly make this about once a week in our house. It’s amazingly easy and even more delicious. Not to mention versatile. And even better, after we’ve stripped the meat off of it I usually make a sipping bone broth from it. I may post the recipe at some point for all of you, but that as well is so fantastically simple it almost seems not worthy of a blog post. But perhaps that’s the beauty of it. And you know what I’ve noticed? I don’t see enough whole roasted chickens shared online nearly enough. But I’m determined to change that. This should be a staple in everyone’s household. I’m 100% sure after you give it that you’ll feel the same way. I know I mentioned how easy it is. And it is. But after making it a million times and perfecting it to a “T”, there are some tips and tricks that I’ve picked up along the way. And don’t even think of venturing outside of them. If you do, please don’t leave a comment saying it wasn’t seasoned enough, it was dry or yadda yadda because… you didn’t follow the directions! Follow the directions below and use the exact ingredients and you will love this chicken more than you thought you could love chicken. So here are some things you’ll want to keep in mind… 1. 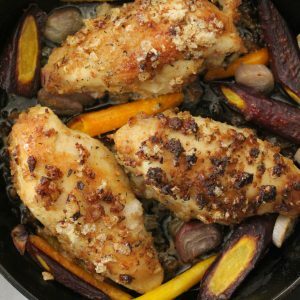 Use maldon salt for the chicken, it’s thin and flaky and delicious and will make the chicken skin the same. 2. 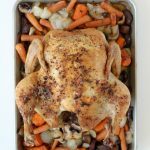 Place the chicken directly on top of the vegetables, the chicken juices and deliciousness will seep right into them and that’s a good thing! 3. 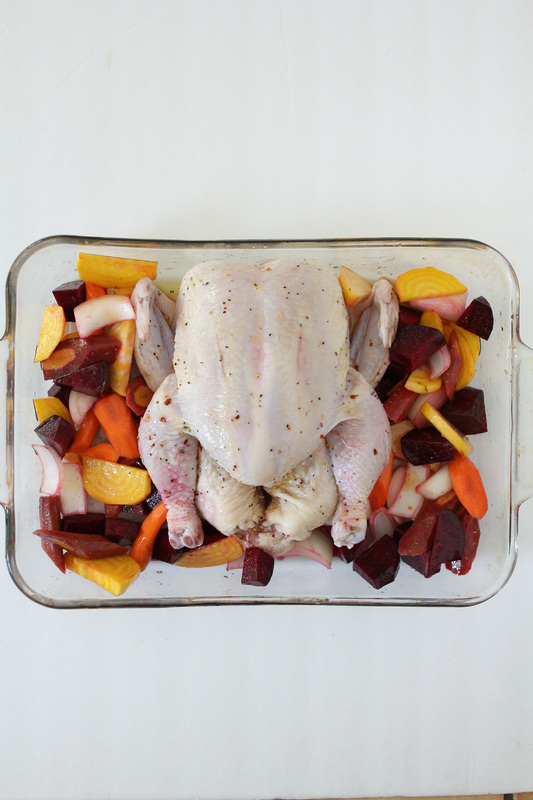 You’ll need two large baking dishes for this as the veggies take a lot of room before they cook down. You’ll eventually combine them into one dish but until them, keep ’em separated. And before you ask, I love tri-colored veggies, so there are purple and white carrots you see in there as well! 🙂 And finally the trick to the crispiest skin you’ll ever have… 4. Using your finger, loosen the skin from the rest of the chicken. This ensures a little bit of breathing room from the moisture of the skin. Also feel free to change the veggies up. As you can see in the picture below I added some beets and it was GREAT addition! Just make sure they’re vegetables that hold up to the heat and roasting. Are you ready for this? Of course you are! 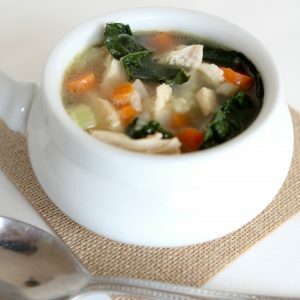 And don’t forget to hover over the image to Pin the recipe for later! Enjoy! Your intro is cracking me up! 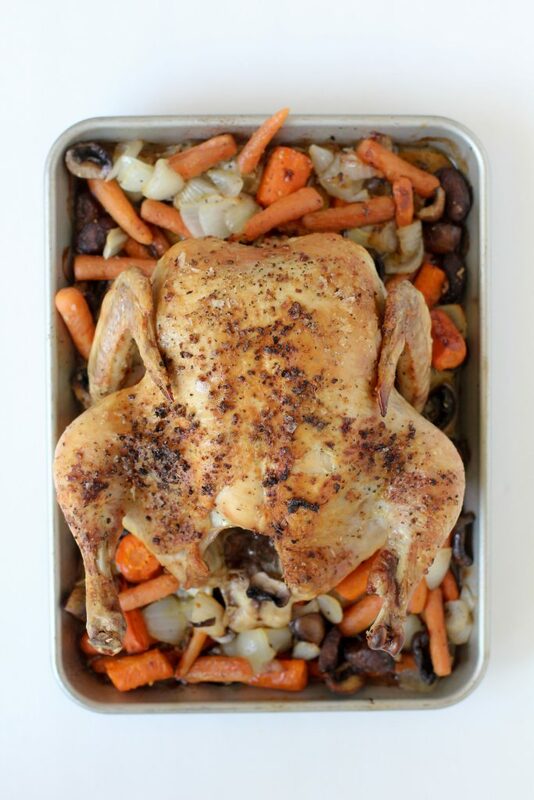 I have never thought about roasting a chicken right on top of the vegetables but I can only imagine how much flavor that gives the veggies. Curious why you don’t truss the chicken? Looks like a lovely recipe. Trying it tonight. Truthfully? Because I’m lazy and never notice a difference if I do! I’m all about saving time where I can. 🙂 How did you like it?? This is SO GOOD! I’m torn between making it every other week and “saving” it so that I don’t get tired of it! Thanks! Making this right now and it’s in the oven making my house smell AMAZING! Can’t wait to taste it! Looks beautiful. I am determined to learn how to do this! The most daunting part is (and forgive my total culinary dumbness) but I’m intimidated by the cleaning out the chicken part prior to roasting. Any tips on that? I do pretty much the same thing and you’re so right. 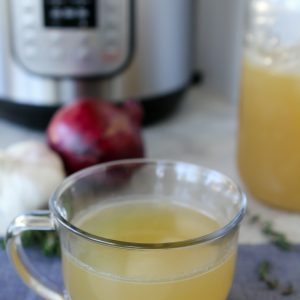 Best chicken ever, makes great leftovers and broth. I think the only step I do different is pat dry the skin to make sure it’s crunchy. 😀 I’d be lying if I said I only did it for my husband. Yes! That is a great tip! So happy you love it! Do you have some extra pieces of chicken sitting under the bird in the pre cooked picture? Do you have any reheating suggestions? Made this tonight (looks and smells amazing) to eat tomorrow… thanks! Is there any other salt I can use? This was one of the best meals I’ve had in recent memory. It was undoubtedly the juiciest chicken I’ve ever had and the veggies were outstanding!!! Very well done, this will be on regular rotation in our house! We’re on whole30 and all the lemon pepper seasoning I found had sugar, so I did an internet search for compliant lemon pepper seasoning, but otherwise made exactly as rcmd! Just did this on the weekend for a house full of company. I tried thighs and legs instead. Still turned out pretty good. Your recipe is very interesting. But it difficult for me to make perfectly. If you add a video about this recipe, It will help me very much to make easily done. Thanks.